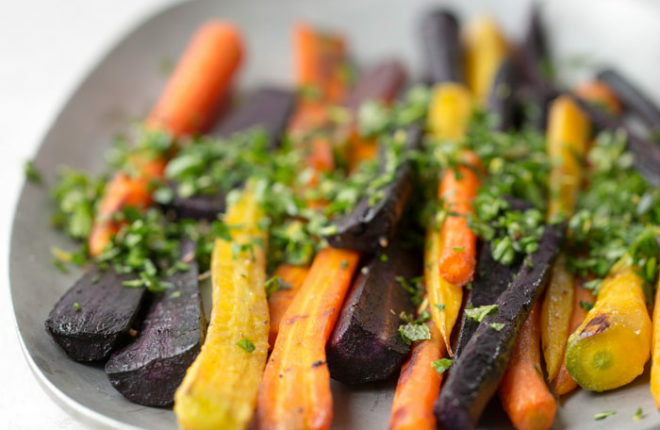 Welcome to the simplest roasted carrots recipe ever! 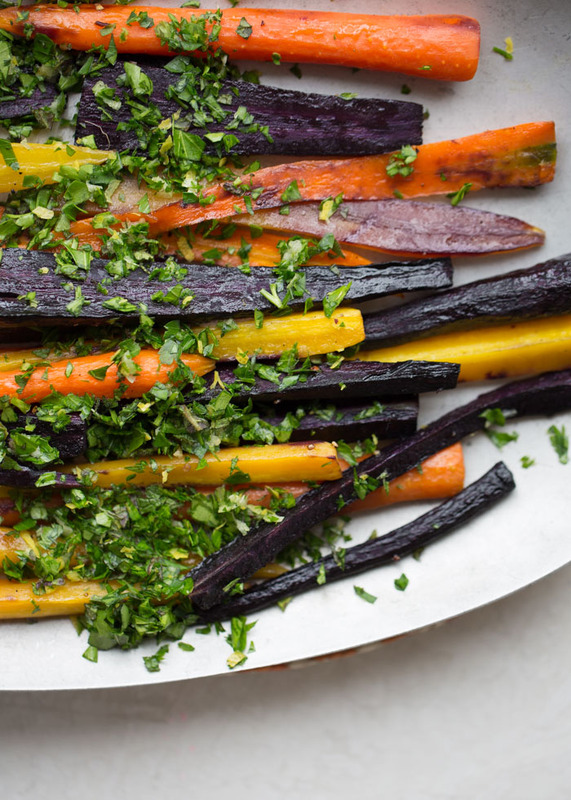 Okay, well – roasted carrots are pretty simple in and of themselves, sure. But this one is simple AND super pretty – delicious and impressive. I mean, just look at those colors! 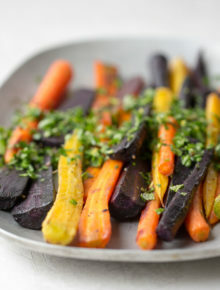 Rainbow carrots are so wonderful. Vibrant shades of yellow, orange, purple … perfection. When topped with bright green herbs, it just amps up the prettiness – and, bonus, the flavor too. In this case, we’ve got a generous sprinkle of gremolata. 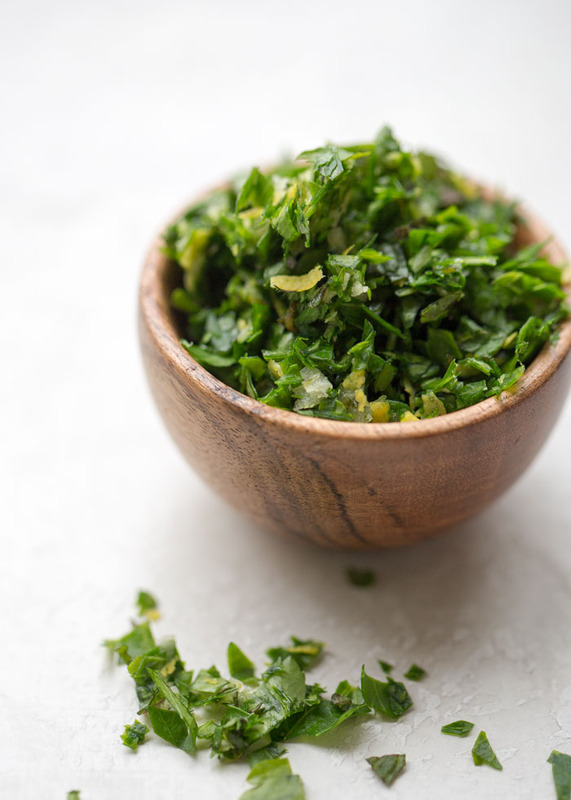 What’s gremolata, you ask? Well, I’m here to tell you! It’s sort of a cross between a simple chopped herb garnish and, I guess, pesto. It’s … garnish 2.0. 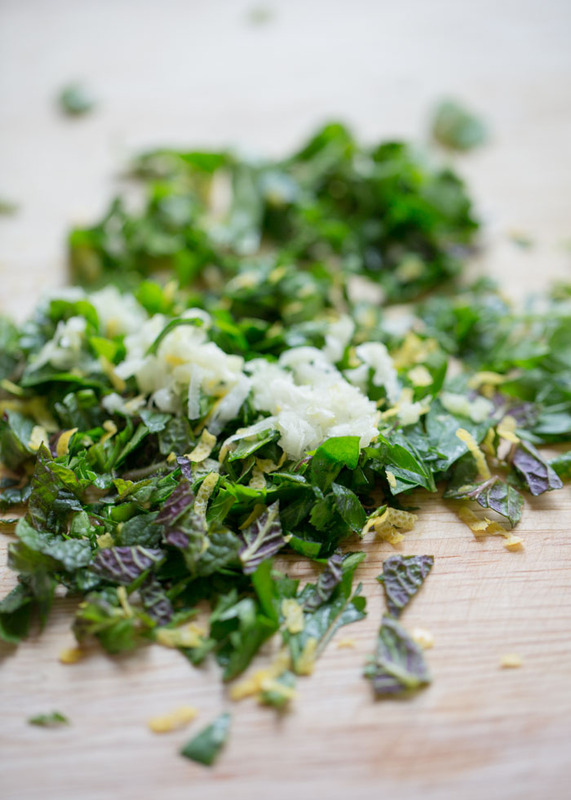 Basically, you chop up fresh parsley, incorporating grated fresh garlic and some lemon zest while you chop. 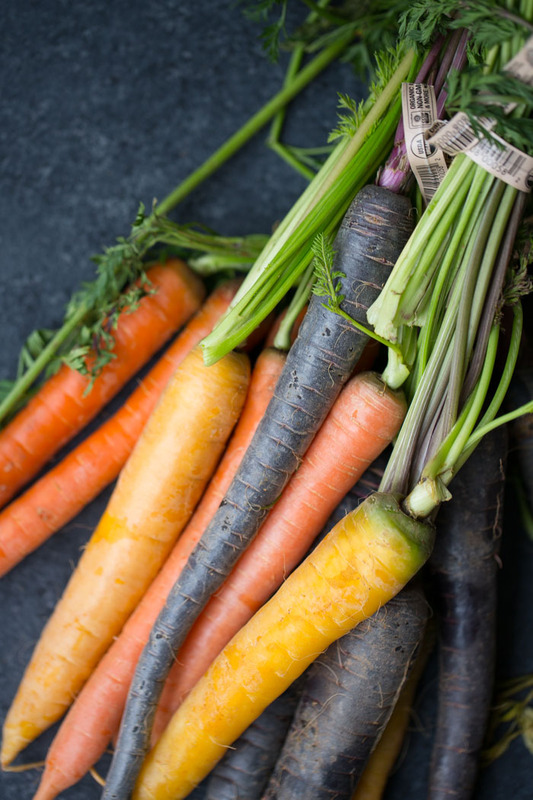 The result is a vibrant, fresh, robust flavor bomb that pairs perfectly with roasted carrots. Especially when you add a bit of fresh mint to the mix, because, you know. Spring. 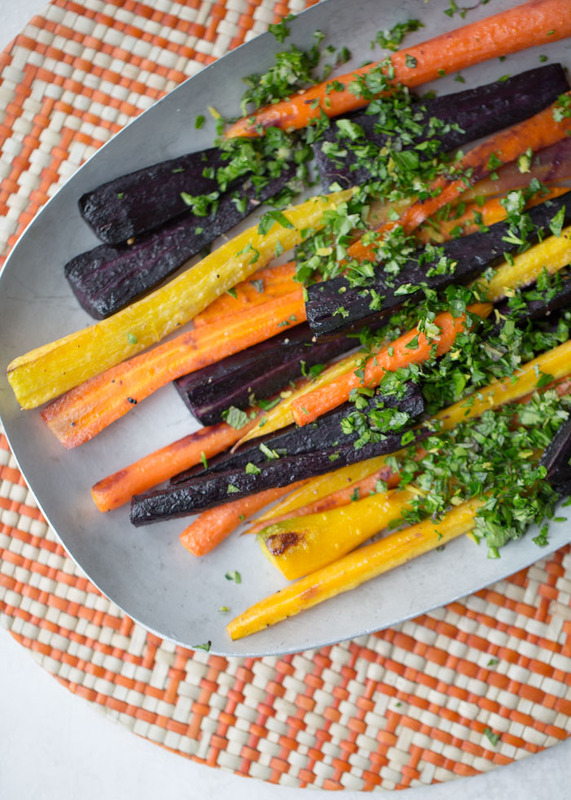 Wanna know how easy Roasted Rainbow Carrots with Mint Gremolata are to make? Here you go. First, you grab your rainbow carrots. Then you peel them and cut them into slightly smaller pieces. Then toss them with olive oil, salt, and pepper, and spread on a cookie sheet. Throw them (okay, gently place them) into the oven to roast and turn your attention to the gremolata. 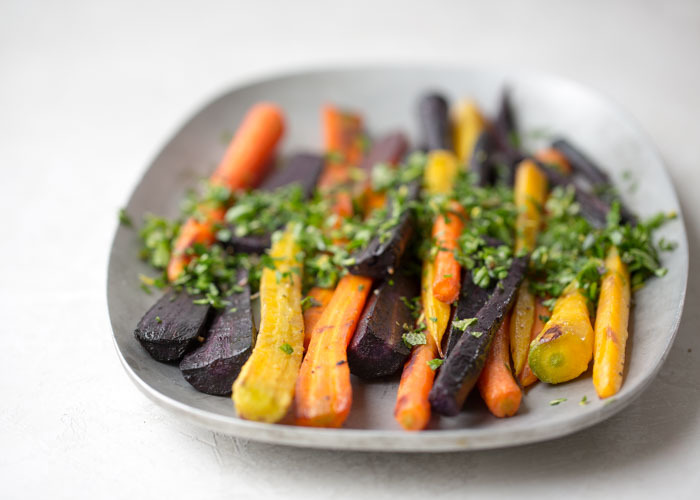 Now pull the carrots out, arrange them on a platter, sprinkle with the gremolata, and serve. Can you hear the oohs and aahs now? I know, right?! Color everyone super impressed. And you didn’t even have to break a sweat. Place carrots in a medium bowl. Drizzle the olive oil over the top and toss until coated. Add the salt and pepper and toss again. Place in the preheated oven and bake until fork-tender and lightly browned in spots, 20-25 minutes. While the carrots roast, make the gremolata. Place the parsley and mint on a cutting board and begin to mince. About halfway through mincing, add the lemon zest and grated garlic. Continue mincing until the herb are finely chopped. When the carrots are done, remove them from the oven and arrange on a platter. Top with the gremolata and serve. * Make sure your garlic is as fresh as possible for the very best flavor.